You are here: Home / Press / Team Stronghold Takes Home The Championship At 2018 Inaugural AHA Kickball Tournament. From the first proposed announcement of the tournament, Team Stronghold knew they wanted to go for the win and bring home the first ever AHA Kickball Championship trophy. But, in order to build a championship team, you have to prepare like a champion. The Bolts held practice every week leading up until the event, preparing themselves for whatever would be “kicked” their way. Pop-fly catching, pitching, base running and more, the team was committed to giving it everything they had for victory. 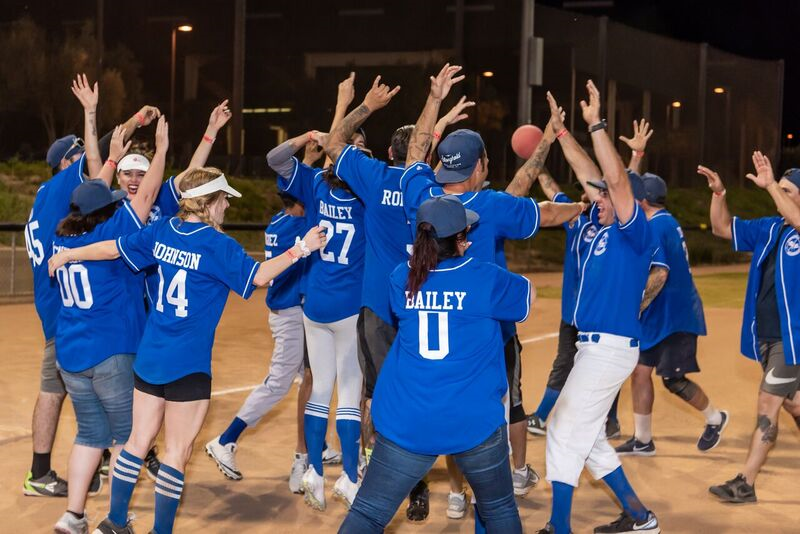 As game day arrived, the word competitive didn’t even begin to describe the emotion and energy the Stronghold Bolts brought with them into the Big League Dreams stadium on Saturday, September 15, 2018. Fitted in their royal blue jerseys, cheering loud, hooting and hollering, Stronghold made sure everyone knew they were there for one thing and one thing only, and they weren’t settling for anything less than first. The tournament began with all 20 teams playing two qualifying games, using the results of these games to structure the seeding for the playoffs. With only 12 spots open for playoffs and a potential for a first round bye up for grabs for the top four seeds, the Bolts knew they needed to bring all they had and leave nothing behind. Game 1, Stronghold took on Pacific Premier Bank on the Angel Stadium field. Feeling confident, Stronghold won the coin flip and took the away position looking to start things off and put some early runs on the board. Jumping out to and solid lead, the Bolts maintained their position scoring more runs and making solid plays in the field. After 50 minutes of intense action, Stronghold took the qualifying round 1 victory. Moving into game two, the Stronghold family and fans really started to show their numbers in the crowd giving that extra motivation to the men and women on the field with their loud yells and cheers of support. The challengers, Stream Kim came ready to play and take down their competitor and client, but the Bolts were up for the challenge and let their solid fielding carry them to a victory. After a clean 2-0 finish in the qualifiers, Stronghold knew they were playoff bound but the anxiety to see where everyone else finished was still on their mind. With a long break until the opening ceremonies and start of playoffs, a little bit of relaxation and bbq is what the team needed before the next games. Outside the stadium the team, family and friends gathered for an awesome tailgate bbq, enjoying burgers, brats, carne asada, ice cold beverages, games and more. A time to reflect on the team’s success so far, an opportunity to strategize for the upcoming games, and to keep the team morale and excitement high. Before the playoff rounds started, everyone gathered for the opening ceremonies, led with the beautiful singing of the “Star Spangled Banner”, a few opening words, and most importantly two touching heart disease survivor stories to remind us why we are all gathered there. The importance of living a healthy lifestyle and making the necessary changes in our lives to prevent us from being a victim of America’s number one killer. It is truly an inspiring thing to see all these companies who have been long time supporters of the AHA, come together for a fun day in the name of heart disease prevention. After opening ceremonies were completed, and Stronghold was named winner of the Best Uniform, it was time to get back into game mode. Missing the top four seed cut off for a first round bye, the Bolts took to the field for their first round playoff game against Adkans Engineering. Confident in their ability to put runners on the bases, Stronghold again took to the top of the inning and were off to an early lead. Efficient base running and communication on the field would lead them to their third victory and on their way to the quarter finals. Riding their momentum into the quarter final game, the Bolts would now face their strongest challenger yet, Lamar. Wether is was tired legs or something in the water, the Bolts seemed to come out a little flat and unmotivated in this game. With three games already played and everyone giving it their all, maybe the team just didn’t have any left in the tank. Missed catches by the Bolts and solid defense from Lamar would hold Stronghold to 1 run with only 10 mins left in the game. Down by 3 and going into what would surely be the team’s last at bat, the Bolts came together for a “It Ain’t Over” moment to hopefully spark a motivational fire under the team. Watching their goal of a championship slip away was not going to fly for Team Stronghold. Digging deep, getting loud and bringing the energy back, the Bolts would put together the inning of the day. When all seemed like nothing could go their way, the team finally clicked and looked like the championship caliber team they were. From a 1-4 deficit, Stronghold managed to get runners on base, make some huge kicks to take the lead, and follow it up with an outstanding last inning defensive stop to go on for the win in the quarter finals. Emotions and energy high, cheers and chest pounding, Stronghold was on to the semi-finals. More confident than ever that they had what it takes to win, the Bolts regrouped for the next game against Pavement Recycling. The momentum carried through to the semi final game, where the team put together another amazing and almost flawless performance sending them to the finals and putting them one step closer to hoisting the championship trophy. The big show under the lights, the moment the team had been working so hard to get to, the championship was now upon them as both teams took to the field for what would be a nail biting, anxiety filled game. The opponent was Cal Baptist University, the team everyone was talking about, a team many thought would surely make it to the championship game. It didn’t matter though because the Bolts knew in a moment like this, all the practicing and all the games played had prepared them for the big stage. Stronghold took off to an early lead and would continue to play shutdown defense for most of the game. With time running out and the Lancers up to bat, the pressure was on as the game moved into the bottom of the 7th. A few great placed kicks by the CBU offense would allow 2 runs to score and put the heat back on the Bolts. Keeping their composure and staying light on their toes, the Stronghold defense would secure a pop fly for the last out of the game and the championship win. 6 games and 10 hours later, the Stronghold Bolts were crowned the 2018 AHA Kickball Champions. All the practice and hard work every person contributed to the team gave them a chance to succeed. Leaving the park sharing hugs and laughs and even a few scrapes and sunburns, the team left with something more important, a memory and experience that they will never forget. In the beginning bonding together as co-workers but together they left as a family of champions. 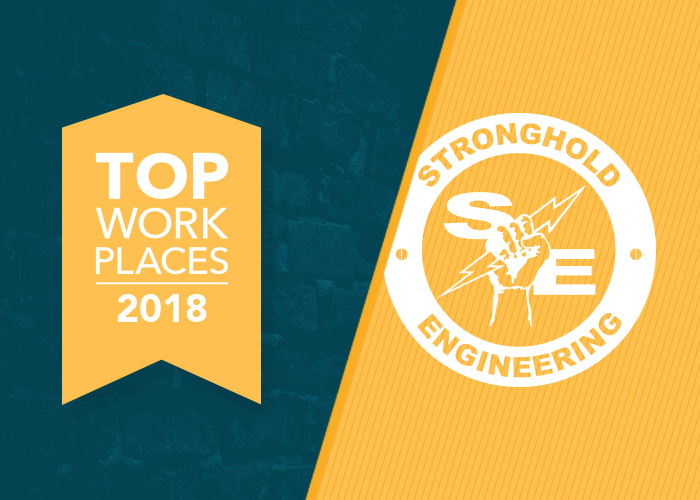 Stronghold Engineering would like to extend a sincere thank you to all the employees who participated in this event, not only dedicating their time on game day but the weekly practices that helped everyone prepare for game day bring home the win. We would also like to thank all the family and friends who came out to support the team and provided the extra motivation to take the Bolts to the end. Road to Repeat Starts Now!